When the nutty and aromatic buerre noisette meets soy sauce, it's a good thing. 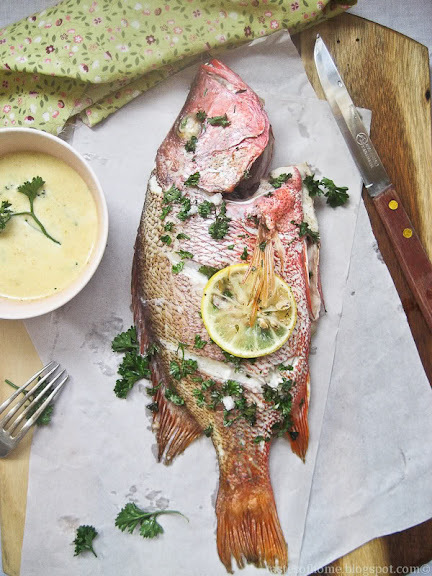 And even though this succulent red snapper, the direct beneficiary of this combination of flavor, is the most visible component, we're focusing on the brilliance of the sauce. So few ingredients; so easy to make; so many possibilities. Get the recipe for this Grilled Red Snapper with Soy-Brown Butter Parsley Sauce from Smoky Wok. Ingredients (for the sauce): butter, cream, garlic, wine, corn flour, soy sauce (counts as salt), parsley (garnish).